Destin sailing charters will allow you to see the Emerald Coast from a different perspective, as we set sail from the Destin Harbor. 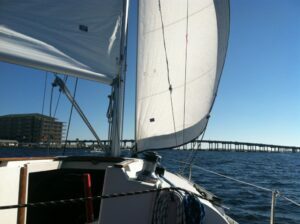 Sail into the Gulf of Mexico or Choctawhatchee Bay and watch for Dolphins. Relax for a few hours under the bimini, sunbathe on deck, trim the sails or customize your private charter. We happily assist you in making plans for a full day of sailing or for a few hours. Captain Bonny Todd has been sailing for thirty years. She enjoys sharing her passion and knowledge of sailing. Captain Bonny is an American Sailing Association Certified Sailing Instructor for Basic Keelboat Sailing through Advance Cruising, and holds an International Certificate of Competency from the Royal Yachting Association. If you live in or are vacationing around the Destin, Okaloosa Island, Miramar Beach, Sandestin, Santa Rosa Beach, 30A, Grayton Beach, Rosemary Beach, WaterColor, Dune Allen, Seacrest Beach, Alys Beach, Seaside, Crystal Beach, WaterSound, Fort Walton Beach, Navarre, Gulf Breeze, Panama City Beach, Florida give us a call as we want to share sailing with you. Check the weather ahead of time and dress for the occasion. We recommend: Sunscreen (lotion only, no oils or sprays), lightweight jacket, sunglasses, hat, camera, either white sole shoes or boating shoes. We offer ice, soft drinks, bottled water and chips and crackers. Please bring along any food or drink preferred. Alcohol is permitted but not provided nor do we purchase upon request. All our charters are non-smoking or vaping. Because we have to: A deposit of 50% is required for reservation confirmation. 24 hour cancellation notice on all charters is required for a complete refund. In the case of inclement weather, we will do our best to reschedule your charter. Cancellations made less than 24-hours notice or for other reasons and “no-shows” will be charged full price of charter.